OBJECTIVE(S): Hepatic Ablation with microwave (MW) or radiofrequency (RF) energy causes prolonged heating of surrounding tissue. In contrast, direct heat application (cautery) vaporizes tissue with minimal surrounding effect. 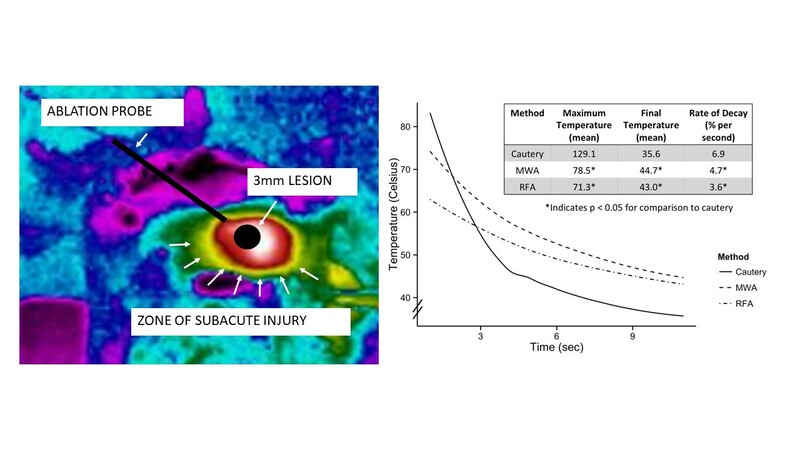 We hypothesize that prolonged heating creates a pro-metastatic environment due to a zone of subacute injury. To test this hypothesis we applied MW, RF and cautery to normal liver with a concomitant metastatic challenge. METHODS: C57/Bl6 mice received intra-splenic injection of 50K MC38 colon cancer cells and hepatic injury with MW, RF or cautery creating a visible 3mm lesion. Thermal imaging recorded tissue temperature during ablation and for 10 seconds after energy cessation. Presence and volume of hepatic metastasis was determined at day 7. RESULTS: Cautery demonstrated the highest maximum tissue temperature (129°C) with rapid return to baseline compared to MW or RF. All mice had metastasis at the ablation site. Mean tumor volume was significantly greater in MW (95.3mm3; p=0.007) and RF (55.7mm3; p=0.015) than cautery (7.13mm3). There was no difference in tumor volume between MW and RF (p=0.2). CONCLUSIONS:Hepatic ablation promotes colon cancer metastasis at the ablation site. Ablation with microwave and radiofrequency energy is more detrimental than cautery. These data suggest prolonged heat injury creates a favorable metastatic environment.